Comments for Caulking epoxy or filler? Whilst I want to agree with almost everything Lars has said I have to point out that wood expansion in no way has anything to do with ANYTHING you ever add to it. Just like man the movement is only changed by age. The Vikings tried and failed to stop movement. Stop trying to change it. The older the wood the more dormant it will be. If you prefer a hard or flexibil caulking material should be decided upon the substance of the wood. Not some salesman logic! Depending on quality of the wood, climate and primer it will more or less shrink or expand! Epoxy is hard and unflexibel binding the wood together forever. Is the hull ready for that solution? Linseed putty with some pine tar is flexibel and will not destroy any materials. I would not mix any grease except sheep grease. (Lanolin?) Keeping it flexibel. I sailed three years with this caulking in a 35' NK 5 1/2 m. One inch Mahogany hull. Except that for small boats with narrow seams I would use cotton below the water line. I like Linsesd Oil Puty. A dob of grease in the Putty is a Good tip. (thanks for that). I mix redlead paint in as well. cotton or oakum for seams, cotton for above water line and decks, Oakum under water. 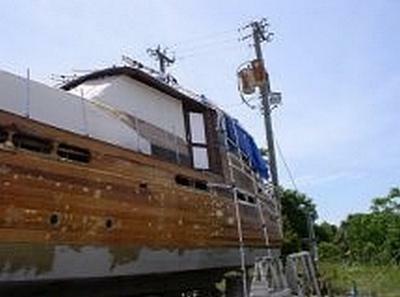 I have just seen a mahogany planked white boat where the owner epoxied the seams about three years ago. This boat is lifted out in the winter and stored under cover. Because of the natural shrinkage in the mahogany when ashore and the absolute non movement of epoxy she has developed cracks in the centre of several planks. These cracks are up to four feet long and some are almost an inch wide. The damage is so extensive that I suspect it means the repairs wont be done. Even now some so called experts are advising he fills the cracks with infill pieces and more epoxy. When the boards take back up he will have washboarding and an even bigger problem. The only solution is to replace about twelve planks and remove the remaining epoxy. Wood swells and shrinks with the season and boats flex when they are moving through a seaway. Make sure your caulking is flexible and elastic too. Some caulks like 3M 5200 meet these criteria but you will curse them when you want to recaulk or do repairs. Mike's suggested caulks are simple, will do the job and are easy to remove. Pettit Seam Compound or Interlux Seam Compound, not epoxy.